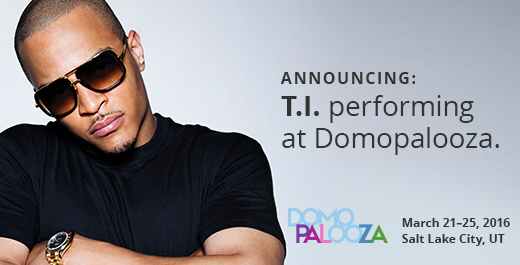 SILICON SLOPES, UT – February 19, 2016 – Today Domo announced that three-time Grammy Award-winning rapper, actor and entrepreneur Tip “T.I.” Harris will perform at Domopalooza™ 2016. As a pioneer of hip hop subgenre trap, Tip has brought Southern rap to mainstream audiences for nearly two decades, with seven of his nine studio albums reaching the top five on Billboard’s charts. His tenth album, “The Dime Trap,” is expected for release later this year on his label Grand Hustle Records. Along with releasing “Dime Trap,” Tip will also star in History’s “Roots” remake (May) and have a featured role in “Sleepless Night” starring Jamie Foxx and Gabrielle Union. Also, the winter collections of his two clothing lines, Hustle Gang and Akoo, are currently in stores and the sixth season of his hit VH1 Show ‘‘T.I. & Tiny: The Family Hustle,” is set to air in the spring. Nelly and Flo Rida will also perform after hours during Domopalooza’s three days of education, training and networking activities. Domo’s lineup of inspiring speakers, includes NBA Hall of Fame athlete and prolific entrepreneur, Earvin “Magic” Johnson, as well as General Stanley McChrystal, best-selling author and former commander of the nation’s premier military counter-terrorism force, Joint Special Operations Command (JSOC). Both will share their insights on leveraging data to make decisions that improve organizational performance. Domopalooza, Domo’s annual customer event, is designed to educate, inform and inspire Domo’s fast-growing community of users from the world’s most progressive organizations and most recognizable brands. Now in its second year, it is being held March 21-23 in Salt Lake City. Event attendees will gain new insights on how to best leverage Domo, their growing universe of business data and industry best practices to operate more efficiently and effectively to improve business results. In 2015, Domopalooza attracted more than 1,300 senior-level attendees across organizations ranging from mid-sized corporations to worldwide enterprises, and Domo expects that number to grow to more than 2,000 this year.